The Transit Festival has come and gone once again. 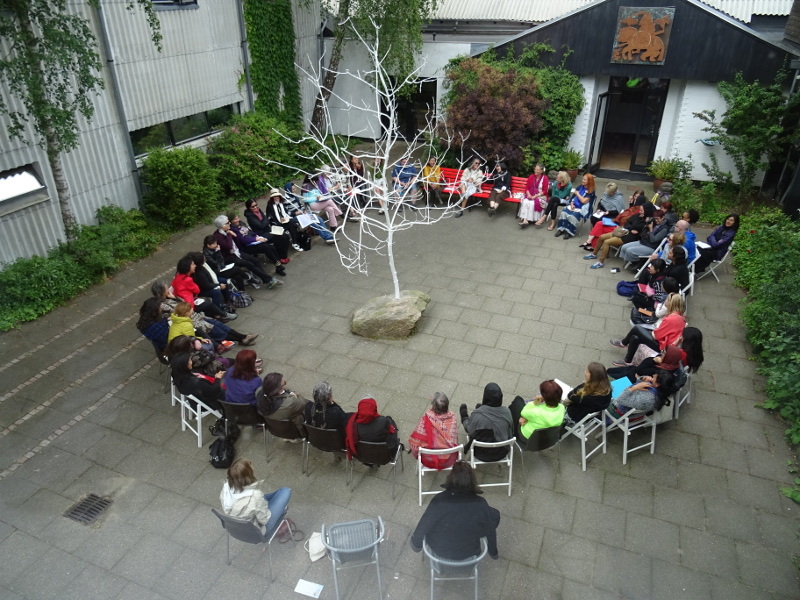 This was the 8th Transit festival, organised roughly every three years since 1992 by Julia Varley at Odin Teatret. It’s one of the high-points of the Magdalena Project festival circuit, as it is the most regular ongoing event as well as the biggest – this year encompassing 12 days. As usual the programme was packed, with early morning training and three performances most evenings, as well as workshops, work demonstrations, presentations and discussions during the day. 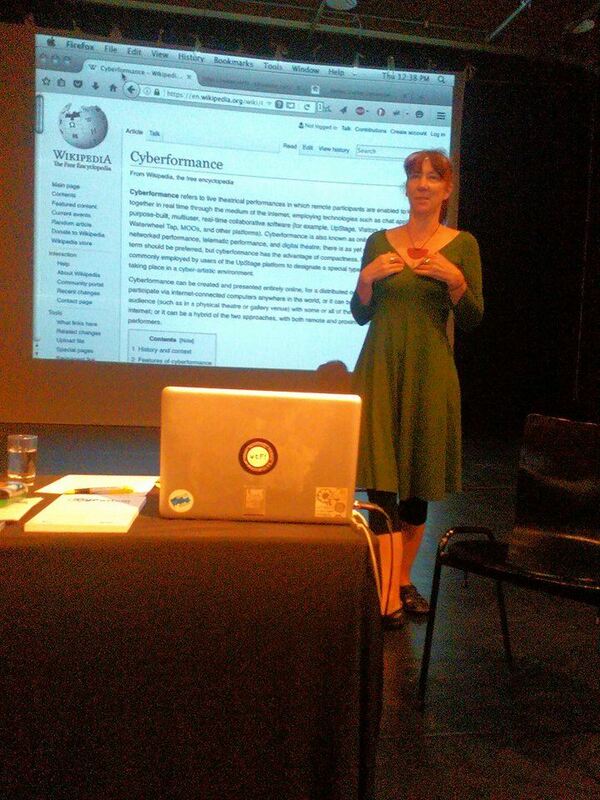 My contribution included a presentation about “We have a situation!”, speaking on a panel about the festival theme “beauty as a weapon”, and creating the installation “her light stretches”. The installation occupied most of my time – more than I’d anticipated (as often happens with such projects!). I had hoped to participate in Deborah Hunt and Madeline McNamara’s workshop “Droll Skirmish”, but after the first morning I had to drop out as I needed all available time to create the installation. “her light stretches” is inspired by Helen Chadwick‘s performance and album “Fragments of Love” – songs that Helen composed from fragments of Sappho’s poetry. 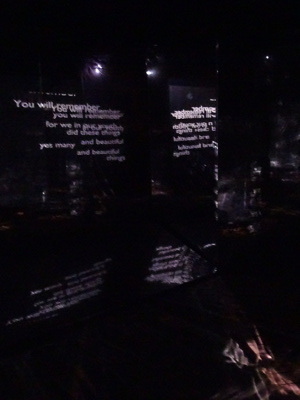 I created text animations for each of the seven songs, and projected these into a space created from large, angled mirror panels. The idea was a development from an installation I made in 2010, with the Austrian artist Eva Ursprung, and I was able to realise it at Transit thanks to Odin Teatret allowing me to use mirror panels from the performance “Andersen’s Dream” and financial support from Munich City Department of Art and Culture. As there was not enough space at the theatre for my installation, the festival found a space nearby – in a former slaughterhouse. The Slagteriet, as it’s called in Danish, had been decommissioned a year or two before and is now used for performances and other arts events. In some areas there are established projects, but most of the space remains almost as it formerly was, even with some of the machinery still in place; some rooms are still cold, damp and stinky. As a vegetarian, I was apprehensive about working in such a place, and needed to do some sort of cleansing ritual before I began. Many at the festival helped me with this: Suzon Fuks volunteered a Reiki cleansing, Ana Wolf gave a stick of sandalwood to burn, Maria Porter went to find sage, and Amaranta Osario bought salt. After some walking, visualising, sprinkling and burning the space began to feel better; and once we started setting up the mirrors and playing Helen’s beautiful songs, there was a definite shift in the energy. My presentation about “We have a situation” and the political aims of this project was well received, and in the panel on “beauty as a weapon” I talked about how beauty is a social construct and asked what “beauty” means for different people, for example what is “beauty” to a terrorist. There were several sessions on this theme, but unfortunately I missed all except the one I was speaking on, due to being preoccupied with my installation. Performances that stood out for me included: Ledwina Constanti’s visceral and surprising “Carnage”, which combined physical and visual techniques in a powerful performance; the beautiful and inventive use of light and projection in Teresa Ruggeri’s “Rovine del Tempo”; Jana Korb’s delightful new aerial work “Frau Vladusch”; Madeline McNamara’s hilarious and provocative work-in-progress about colonisation and racism; and the fantastic festival finale – “Babayaga” in masks, puppets, costume and the wonderful “crankies”, by Deborah Hunt and Sugeily Rodriguez. The lunchtime “Poetry Menu” performances by Camilla Sandri and Roberta Lanave – where we could select a poem from a menu and have it deliciously recited at our table – was also a delight. And there were “old favourites”, new works from Magdalena regulars, others presenting work at a Magdalena festival for the first time, works-in-progress and more. There were two other personal highlights for me in this festival. 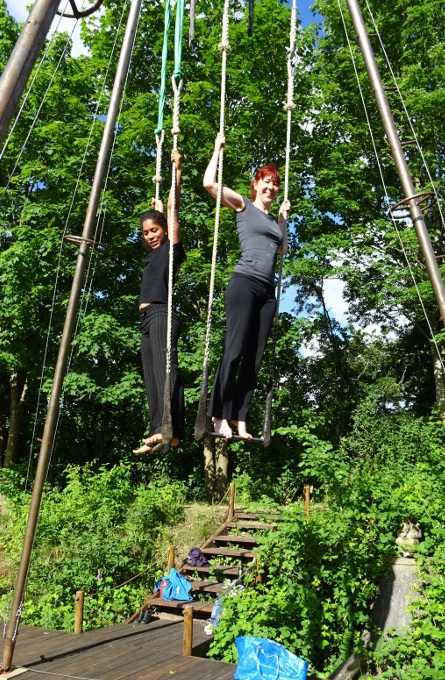 One was early morning trapeze training on Jana’s trapeze, which was set up outside at the edge of the theatre’s lawn. This took me to the limits of my physical ability; how is it that as a child I could effortlessly swing myself up onto the playground bars and spin around without any problem, but now I can’t even get my legs up without help? Admittedly the bar is higher up, and I’m a lot heavier than when I was 10 years old. With a bit of help from Jana I got there, and once up it was a great sense of accomplishment to sit, stand and do some very modest moves. To be continued, I hope! The other highlight was the spontaneous opportunity to drive the forklift. The day after the festival ended, the Odin techs were busy moving things around – loading up a truck with the set of “The Chronic Life” to head off the next day to Romania, and putting things back in the storage area that had been our festival dining room. At one point I came out of the theatre and there was the little forklift, standing in the courtyard. I’d seen Fausto driving it at the end of the previous Transit and had expressed my desire to have a go one day – and this day my wish came true! Did you know that forklifts don’t have a break pedal? Just one pedal to go forward and one to reverse. 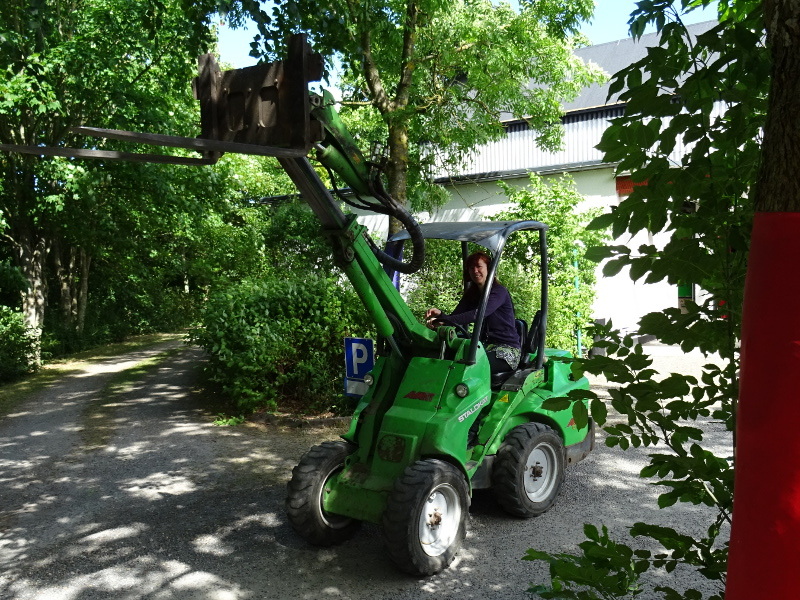 The lever for raising and lowering the fork at the front was a bit more complicated, so I just concentrated on driving. It was a great way to end my fifth Transit experience! Thank you Julia, Nathalie, and everyone who makes Transit happen!